The heat on the ruling Telugu Desam Party (TDP) to sever its ties with the Bharatiya Janata Party (BJP) gained momentum on Thursday, 8 February, as opposition parties observed a shutdown across Andhra Pradesh. Though Chief Minister N Chandrababu Naidu made it clear on 5 February that the alliance with the BJP at the Centre and the state will continue, he has also asked his party’s MPs to persistently voice their anger against the “injustice” meted out to the state in Budget 2018. Schools and bus services remained shut as members of opposition parties led by the Left staged sit-ins at many places across the state. The protesters, including members of Congress and YSR Congress, are demanding a special status for the state under the Andhra Pradesh Reorganisation Act 2014. Members of actor-turned-politician Pawan Kalyan’s newly formed party, Jana Sena, were seen marching on the streets protesting against the indifference shown to the state by the Centre. According to The Hindu, Jana Sena workers ate grass as a mark of protest in Eluru. Janasena supports tomorrow’s Bandh call given by AP political parties. But Janasena cadre should confine to only peaceful protest without inconveniencing public.The purpose of Bandh is to express people’s pain to centre and state Govt. Members of the TDP, too, held parallel demonstration in the state while the party’s MPs continue to raise the matter in the Parliament on Thursday morning. On Wednesday, TDP MP in the Rajya Sabha CM Ramesh was suspended for disrupting proceedings over the issue of special status to Andhra Pradesh. On the same day in the Parliament, Jayadev Galla, TDP MP from Guntur, accused the Centre of resorting to “delaying tactics in Polavaram, Railway Zone, Vizag,Vijayawada Metro and Amaravati”. On Thursday, he again accused the NDA government of not doing anything to fulfil the promises made at the time of bifurcation of the state. Referring to the funds provided by the Centre to Andhra Pradesh, Galla quipped that even the collections made by ‘Baahubali’ were more than what the state received from the centre. According to reports, ‘Baahubali- The Conclusion’ earned about Rs 1,700 crore from Indian and overseas markets. AP People’s heartbeat heard in Parliament to “Get Our Due”. 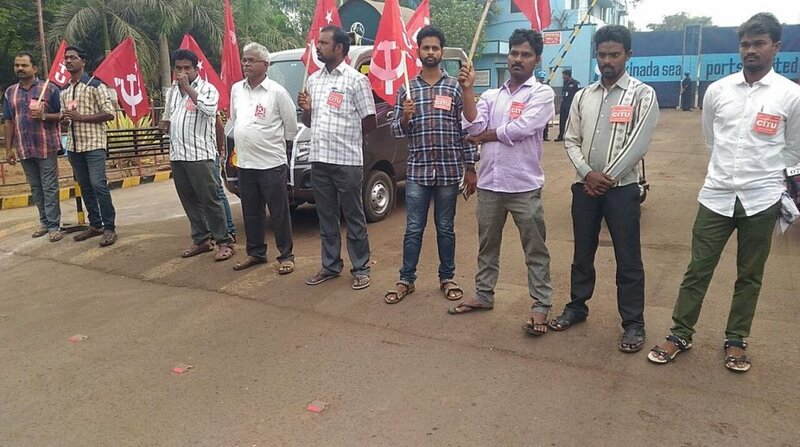 The protests have been most effective in Vishakhapatnam where over 1200 Andhra Pradesh State Road Transport Corporation (APSRTC) buses have stopped operations. Heavy police deployment has been put in place in anticipation of the bandh in cities such as Vijayawada, Srikakulam, Anantpur and Tirupati among others. Though the protests have been peaceful, Superintendents of Police in all districts have been directed to take precautionary measures to maintain law and order and protect public property. The Budget announced on 1 February further strained the relations between the BJP and TDP. Following the presentation, Naidu called a meeting of his party’s leaders in Amaravati to discuss the future course of action. Following the end of Jaitley’s Budget speech, Union Minister of State for Science and Technology & Earth Sciences YS Chowdary, who is also a TDP member, said that the Budget was “deeply disappointing”. He pointed out that many key projects that would be necessary for the growth of Andhra Pradesh are hanging in the balance because of a lack of allotments. According to TDP leaders and other party leaders of Andhra Pradesh, issues such as the construction of a Railway Zone, the Polavaram project funding and funding for capital city of Amaravati were not addressed in the Budget. Only the BJP is not supporting the bandh call.